A week after WrestleMania 35, WWE announced the Superstar Shakeup on both RAW and SmackDown. In the Superstar Shakeup Superstars from NXT, 205 Live, RAW and SmackDown can be moved to either RAW or SmackDown. 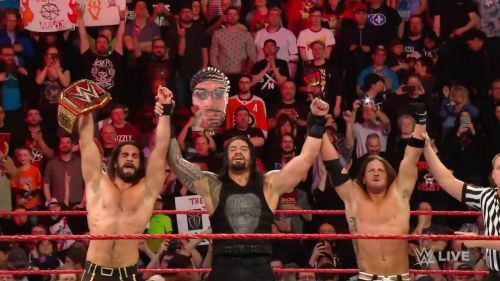 On RAW, we had quite a few surprise names that were announced for the red brand. We will learn about more Superstars moving between the red brand and blue brand tomorrow on SmackDown Live. The Miz faced off against Shane McMahon at WrestleMania 35 and lost the match despite plowing Shane from the top of a camera platform. Shane and Stephanie McMahon opened RAW this week, and while Shane was on the mic, The Miz's music hit and The Miz attacked Shane from behind before a brawl ensued. The commentators announced that The Miz will now be on RAW. Current NXT Tag Team champions, War Raiders, were rebranded and added to RAW as The Viking Experience, and now will go by the ring names Erik and Ivar. They were involved in an eight-man tag team match where they teamed up with The Revival to take on Aleister Black, Ricochet, and current RAW Tag Team champions, Curt Hawkins and Zack Ryder. The Viking Experience kicked off their first night on RAW with a win. Ricochet and Aleister Black have been on a great run on RAW and SmackDown since being announced for the main roster, and even had a great match at NXT Takeover: New York against two of their opponents on RAW, The Viking Experience. The two high-flying, athletic Superstars will now be on the red brand. Andrade was Finn Balor's mystery opponent and arrived on RAW with Zelina Vega. Andrade got the win over the Intercontinental champion after a distraction from Vega helped the former SmackDown and NXT star.